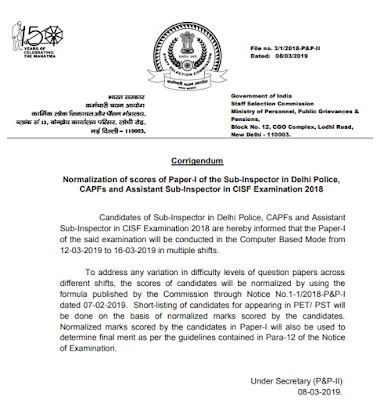 Staff Selection Commission has released a notice regarding Normalization of scores of Paper-I of the Sub-Inspector in Delhi Police, CAPFs and Assistant Sub-Inspector in CISF Examination 2018. SSC CPO 2018 Paper-I will be conducted in the Computer Based Mode from 12-03-2019 to 16-03-2019 in multiple shifts. To address any variation in difficulty levels of question papers across different shifts, the scores of candidates will be normalized by using the formula published by the Commission through Notice No.1-1/2018-P&P-I dated 07-02-2019. Short-listing of candidates for appearing in PET/ PST will be done on the basis of normalized marks scored by the candidates. Normalized marks scored by the candidates in Paper-I will also be used to determine final merit as per the guidelines contained in Para-12 of the Notice of Examination.